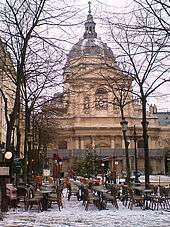 The University of Paris (French: Université de Paris), metonymically known as the Sorbonne (French: [sɔʁbɔn], its historical house), was a university in Paris, France. Appearing around 1150 as a corporation associated with the Notre Dame de Paris cathedral school, it was the second-oldest modern university in Europe. 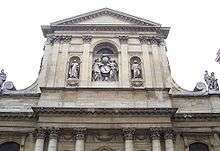 Chartered in 1200 by King Philip II (Philippe-Auguste) of France and recognised in 1215 by Pope Innocent III, it was often nicknamed after its theology collegiate institution, College of Sorbonne, founded about 1257 by Robert de Sorbon. The corporation was formally recognised as a "Universitas" in an edict by king Philippe-Auguste in 1200: in it, amongst other accommodations granted to future students, he allowed the corporation to operate under ecclesiastic law which would be governed by the elders of the Notre-Dame Cathedral school, and assured all those completing courses there that they would be granted a diploma. 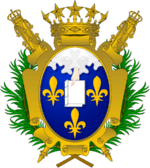 The faculty and nation system of the University of Paris (along with that of the University of Bologna) became the model for all later medieval universities. Under the governance of the Church, students wore robes and shaved the tops of their heads in tonsure, to signify they were under the protection of the church. Students followed the rules and laws of the Church and were not subject to the king's laws or courts. This presented problems for the city of Paris, as students ran wild, and its official had to appeal to Church courts for justice. Students were often very young, entering the school at age 13 or 14 and staying for 6 to 12 years. 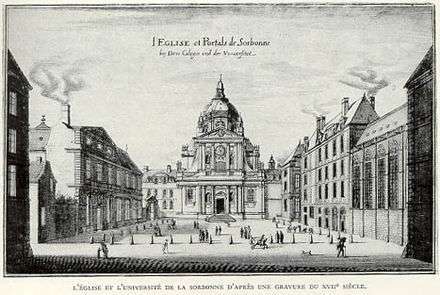 Four colleges appeared in the twelfth century; they became more numerous in the thirteenth, including Collège d'Harcourt (1280) and the Collège de Sorbonne (1257). 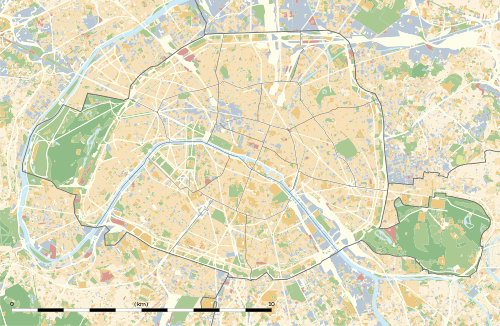 Thus the University of Paris assumed its basic form. It was composed of seven groups, the four nations of the faculty of arts, and the three superior faculties of theology, law, and medicine. 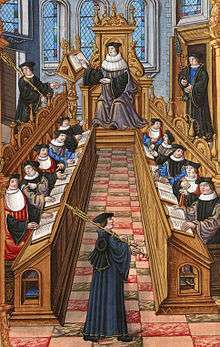 Men who had studied at Paris became an increasing presence in the high ranks of the Church hierarchy; eventually, students at the University of Paris saw it as a right that they would be eligible to benefices. Church officials such as St. Louis and Clement IV lavishly praised the university. Besides the famous Collège de Sorbonne, other collegia provided housing and meals to students, sometimes for those of the same geographical origin in a more restricted sense than that represented by the nations. There were 8 or 9 collegia for foreign students: the oldest one was the Danish college, the Collegium danicum or dacicum, founded in 1257. Swedish students could, during the 13th and 14th centuries, live in one of three Swedish colleges, the Collegium Upsaliense, the Collegium Scarense or the Collegium Lincopense, named after the Swedish dioceses of Uppsala, Skara and Linköping. The German College, Collegium alemanicum is mentioned as early as 1345, the Scots college or Collegium scoticum was founded in 1325. The Lombard college or Collegium lombardicum was founded in the 1330s. The Collegium constantinopolitanum was, according to a tradition, founded in the 13th century to facilitate a merging of the eastern and western churches. It was later reorganized as a French institution, the Collège de la Marche-Winville. The Collège de Montaigu was founded by the Archbishop of Rouen in the 14th century, and reformed in the 15th century by the humanist Jan Standonck, when it attracted reformers from within the Roman Catholic Church (such as Erasmus and Ignatius of Loyola) and those who subsequently became Protestants (John Calvin and John Knox). At this time, the university also went the contriversy of the condemnations of 1210–1277. Measures were to be taken immediately: "For means of execution the department and the municipality of Paris are authorized to consult with the Committee of Public Instruction of the National Convention, in order that these establishments shall be put in action by 1 November next, and consequently colleges now in operation and the faculties of theology, medicine, arts, and law are suppressed throughout the Republic". This was the death-sentence of the university. It was not to be restored after the Revolution had subsided, any more than those of the provinces. All the faculties were replaced by a single centre, the University of France. After a century, people recognized that the new system was less favourable to study. They restored the old system of separate faculties in 1896, but without the faculty of theology. Following these events, de Gaulle appointed Edgar Faure as minister of education; Faure was assigned to draft reforms about the French university system, with the help of academics. 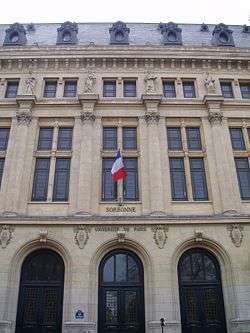 Their proposal was adopted on November 12; in accordance with the new law, the faculties of the University of Paris were to reorganize themselves. 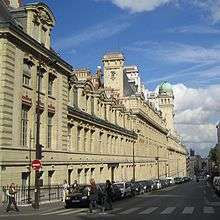 Some of the new universities took over the old faculties and the majority of their professors: humanities by Paris-Sorbonne University, law by Panthéon-Assas University, medicine by Paris Descartes University, and natural sciences by Pierre and Marie Curie University and Paris Diderot University. Others, like Panthéon-Sorbonne University, chose to be multidisciplinary. Most of these universities have joined, or are in the process of forming (2013), new groupings along the lines of a collegiate university. Typically, these groupings take the legal form of a Center for Research and Higher Education (Pôle de Recherche et d'Enseignement Supérieur, or PRES), though some have opted for other forms of organization. These groupings mix universities and grandes écoles and add a new administrative layer over the existing ones. 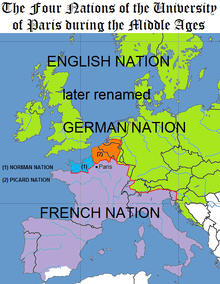 Some alliances have been terminated, such as Paris Universitas, Paris Centre Universités or UniverSud Paris, and some other are still in discussion. 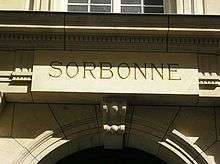 ↑ "Sorbonne University - the University of Paris". Retrieved 2016-06-18. ↑ Marshall, ed., p. xviii; Readings, p. 136. 1 2 Readings, p. 136. ↑ Readings, p. 136; Rotman, pp. 10–11; Pudal, p. 190. ↑ Pudal, p. 190; Giles & Snyder, ed., p. 86. ↑ Pudal, p. 191; Mathieu, p. 197; Giles & Snyder, ed., p. 86. ↑ Berstein, p. 229; loi no 68-978 du 12 novembre 1968. This article incorporates text from a publication now in the public domain: Herbermann, Charles, ed. (1913). "University of Paris". Catholic Encyclopedia. New York: Robert Appleton.